From a broad choices of Momiji's appetizer menu, Sushi Tower is Momiji's most iconic appetizer, there are delicate peices of salmon, white tuna and maguro are layered with crab salad, avocado and rice, then topped with wpicy eel & garlic sauce, fish roe, tempura crumbs and sesame seeds. Every Momiji lovers know about its amazing taste. A food of Asian origin that features rice and seafood wrapped in seaweed (nori). Until the end of the twentieth century, sushi rolls were only available in restaurants. Although a few companies use mechanical sushi makers to shape the rice and add condiments, the finest quality sushi rolls are always those were handmade. When it comes to sushi, what first crops up in most people's minds is the sushi rolls. However, people who are more familiar with sushi know that the Nigiri is a more popular and original form of sushi. (wow...) Sushi grade fish laid over hand formed balls of rice, two pieces per order. Yakisoba is most familiarly served on a plate either as a main dish or a side dish in Japan. Yakisoba is prepared by ramen-style wheat noodles with bite-sized chicken, vegetables (usually cabbage, onions or carrots) and flavored with yakisoba sauce, salt and pepper. It can be served with a variety of garnishes, such as aonori (seaweed powder), beni shoga (shredded pickled ginger), katsuobushi (fish flakes), and mayonnaise. Here in Momiji we serve variety flavors of Yakisoba Noodles in lunch and dinner portion, all entrees are served with miso soup. Yes, we have Bento Boxes too! They are Box-shaped containers filled with a variety of items from the choices of teriyaki chicken, grilled salmon, crispy chicken katsu and Fiery spicy chicken. Come and check out our entree menu to pick a perfect one for you. Unlimited Sushi Rolls and Nigiri are available in all Momiji locations. For only $27.98 per person and $8.98 for kids 3-10, you can enjoy Momiji All-You-Can-Eat Sushi, including unlimited Sushi Rolls, Nigiri and selected Appetizer. (2 person minimum with other rules applied). 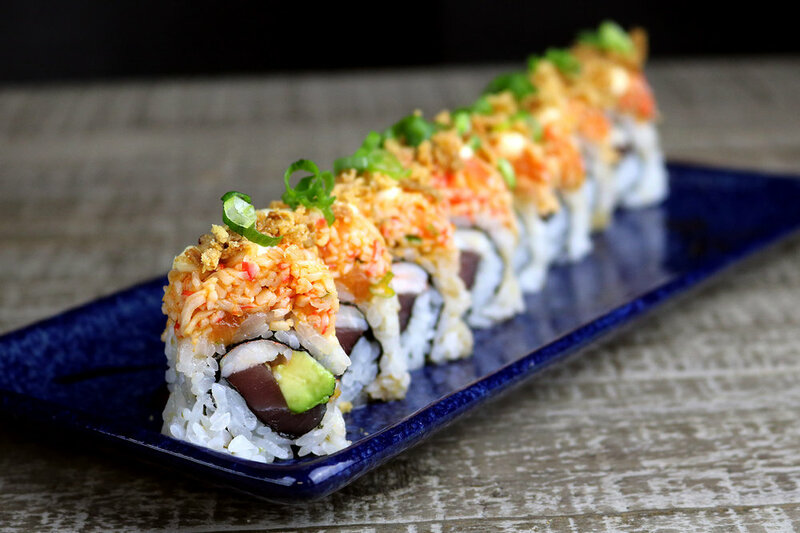 Every Tuesday we offer 2 sushi rolls combination that is discounted, so that it's perfect time to try a roll you've always been curious about.